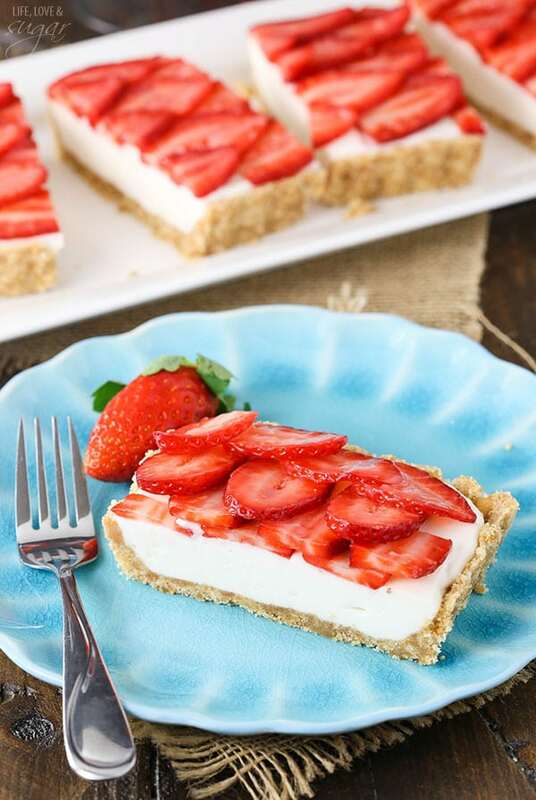 This Strawberry Champagne Tart has champagne and mascarpone cheese in the filling, is topped with beautiful sliced strawberries and is lightly covered with a champagne glaze. 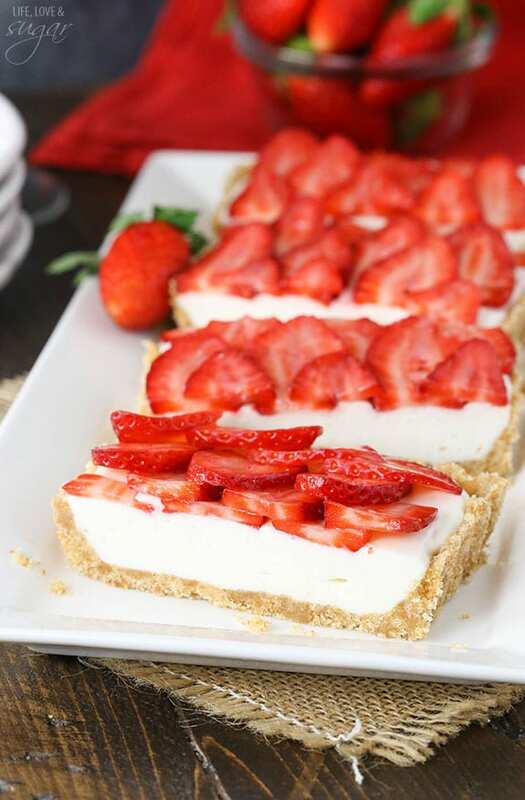 It’s light, no bake and the perfect dessert to celebrate New Year’s Eve! I hope everyone had a lovely Christmas and holiday! I was a little more absent then usual as I spent some time with my family while they were in town. It was wonderful to step back for a bit and recharge. I got a little sleep, enjoyed my birthday (on Christmas Day) and feel refreshed! I hope you all were able to enjoy some time relaxing as well. Now it’s time to get ready for the next holiday! It always surprises me how New Year’s Eve just sneaks up on you right after Christmas. The great thing about this dessert is that it’s easy to put together and there’s no need to bother with the oven. You will use your stove though. To start, you’ll make the crust. It’s nice and easy with vanilla wafers, a little sugar and some melted butter. 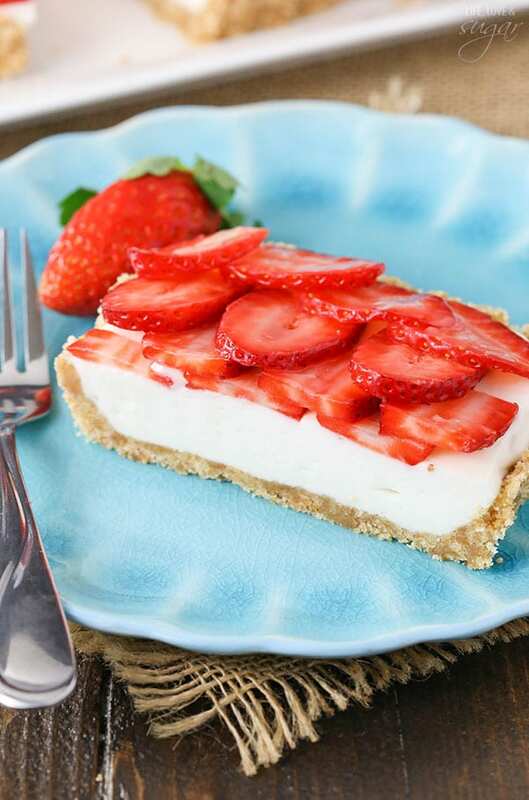 It’s much like a graham cracker crust, but I prefer the flavor of the vanilla wafers in this tart. Next is making the filling. It uses gelatin to help it set. Sprinkle the gelatin over a little cold water and let it sit for about 5 minutes while you work on the next step. Be sure that the gelatin is all touching water and you don’t end up with powder sitting on top, otherwise it’ll have a tougher time incorporating later. Add 3/4 cup of champagne to a saucepan with some cornstarch and sugar. Heat them until they are hot and just starting to simmer and thicken. Pop the gelatin into the microwave for a quick 5-10 seconds, until it’s melted, then add to champagne mixture. Whisk it in until smooth, then remove from heat to cool. I usually pour the mixture into another bowl and pop it in the fridge to help it cool more quickly. Mine took about 20 minutes to thicken. It’s ready when it’s jiggly, but not firm, and still easy to stir. While the gelatin mixture is cooling, make the whipped cream. 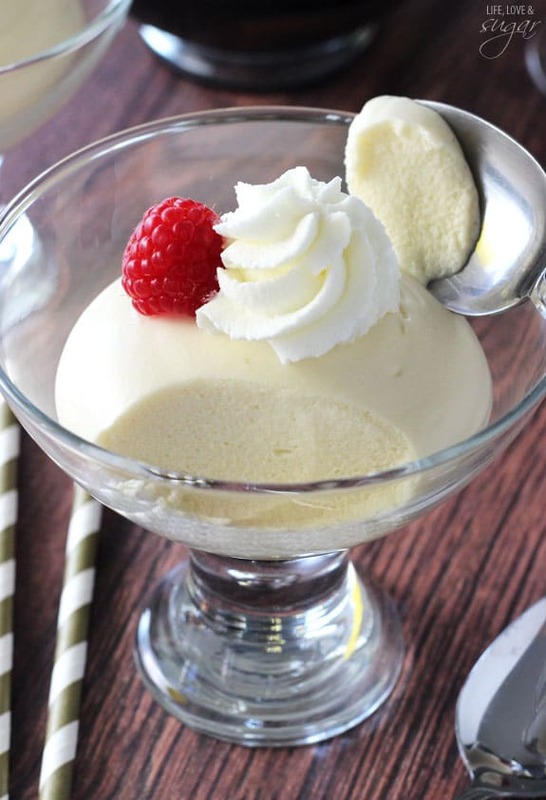 Carefully fold the room temperature mascarpone into the whipped cream. Once the gelatin mixture is ready, stir it into the whipped cream mixture. 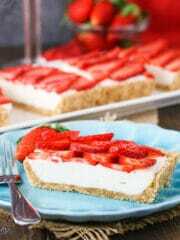 I used a whisk to help it all incorporate, then spread the filling evenly into the tart pan. I used a 13.75 inch by 4.25 inch tart pan, but you could use a 9 inch round tart pan as well if that’s what you have on hand. 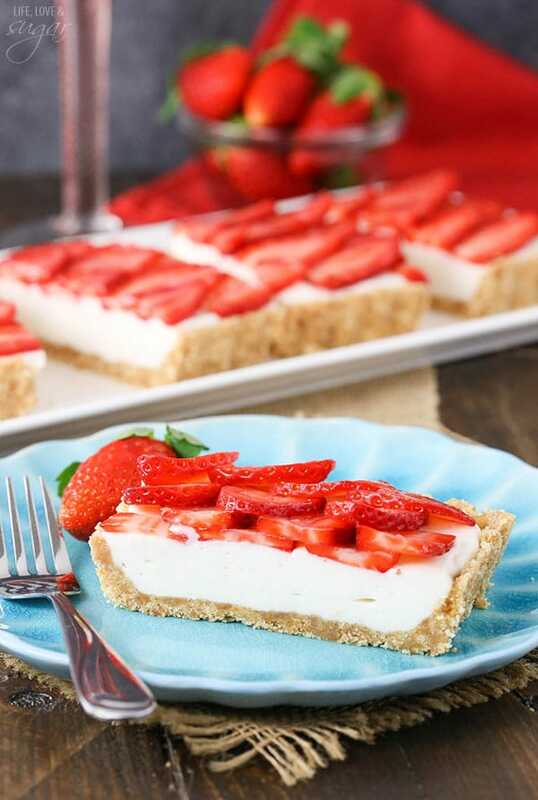 Top the tart with the sliced strawberries in whatever pattern you like. 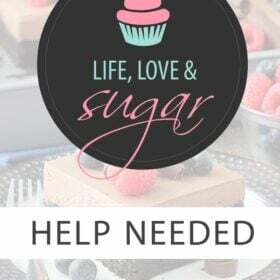 To make the glaze add the champagne, cornstarch and sugar to a small bowl and microwave in 10 second increments until thickened, about 30 seconds. It thickens pretty quickly. Use a pastry brush to brush the strawberries with the glaze. 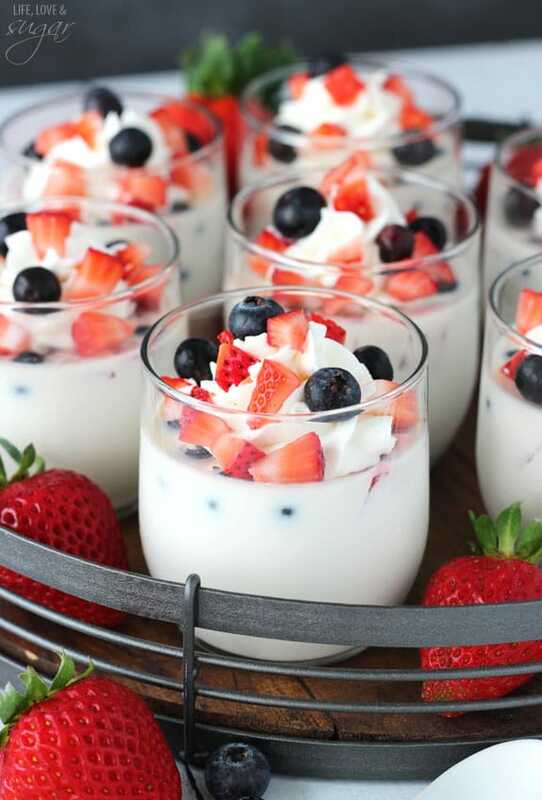 While you could leave the glaze off, it does help to preserve the moisture and freshness of the berries. If you are making this a day or so ahead, I’d suggest using the glaze. Refrigerate the tart until firm, then remove it from the tart pan. This tart really is a super light, but fun and festive dessert. If you’re like me, you’ve eaten lots of heavy food over the last week and a light, airy dessert is just what you need. Happy New Year! 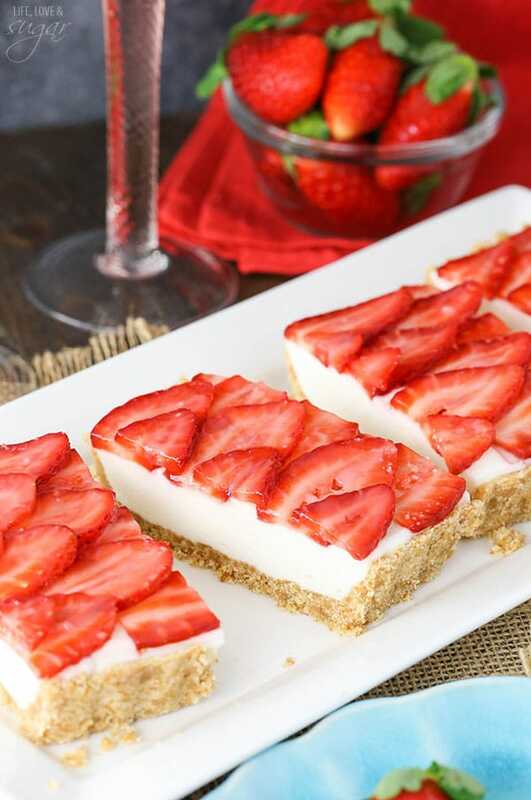 A champagne and mascarpone cheese filling topped with sliced strawberries and lightly covered with a champagne glaze. 1. Combine vanilla wafer crumbs, sugar and melted butter. 2. Grease a 9.75 by 4.25 inch rectangular tart pan, then press the crumbs into the bottom and up the sides of the pan. Set aside. 3. In a small bowl, sprinkle gelatin over cold water. Set aside for about 5 minutes. 4. Add champagne, cornstarch and sugar to a sauce pan and heat on medium-high until champagne is hot and just starting to simmer around the edges. Do not boil. 6. In another bowl, whip heavy whipping cream until it starts to thicken. 7. Add powdered sugar and whip until stiff peaks form. 8. Fold the mascarpone cheese into the whipped cream. 9. Carefully fold cooled champagne mixture (it should be thickened and jiggly, but not firm yet) to mascarpone cheese mixture and mix until combined. 10. Spread mixture evenly into crust. 11. 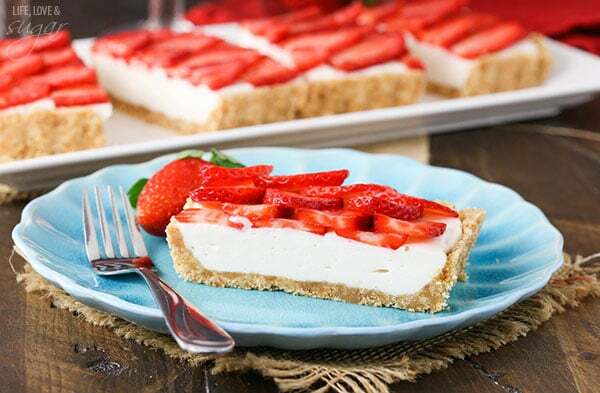 Layer sliced strawberries onto of tart filling. 12. Combine champagne, cornstarch and sugar for the glaze in a small bowl. Microwave in 10 second increments until thickened, about 20-30 seconds. 13. Brush glaze onto strawberries with a pastry brush. 14. 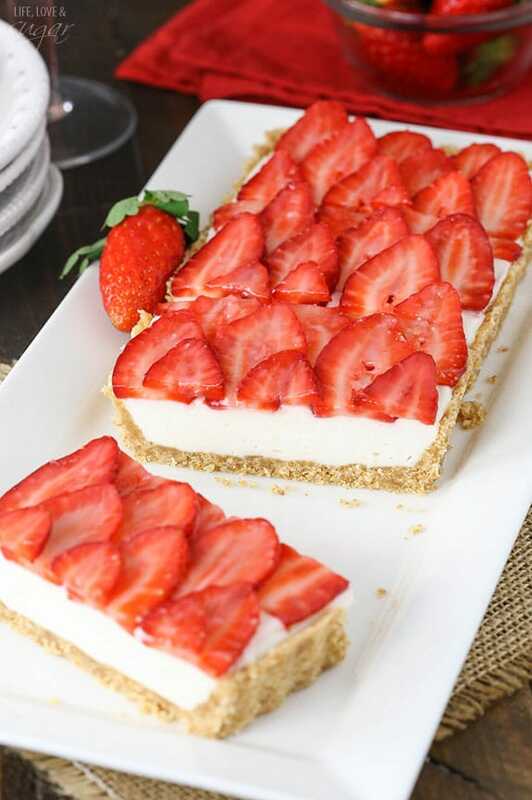 Refrigerate tart until firm, about 3-4 hours. This page includes affiliate links. Lindsay, I don’t have that size of a tart pan. Would this work in a 13 x 9, other than looking less pretty, of course? 13 x 9 pan is probably about double the size of the rectangular tart pan, so I’d double the recipe for that size pan. You could also use a 9 inch tart or pie pan. Thanks for the reply, Lindsay! 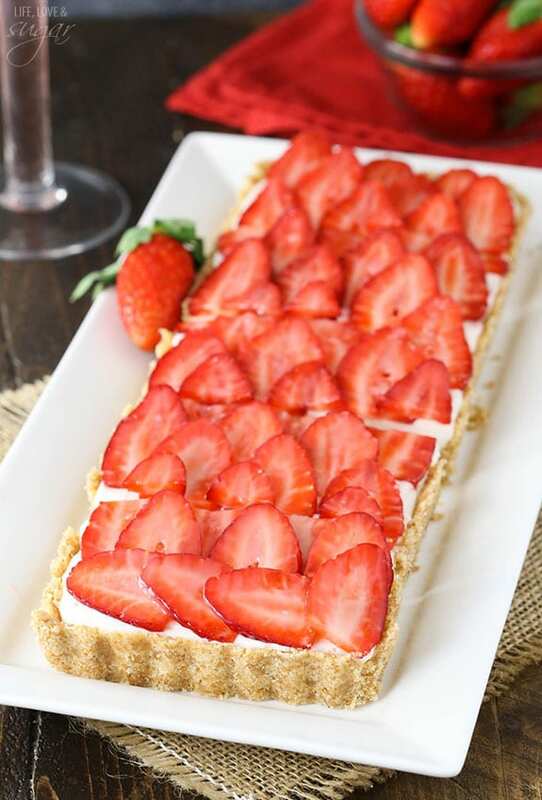 This tart would be perfect for an upcoming New Year party. Nothing goes together better than strawberries and champagne. Gorgeous tart, Lindsey! Strawberries are always beautiful no matter the time of year! So gorgeous! This was so delicious! My strawberries weren’t very sweet and the glaze helped bring out the sweetness. 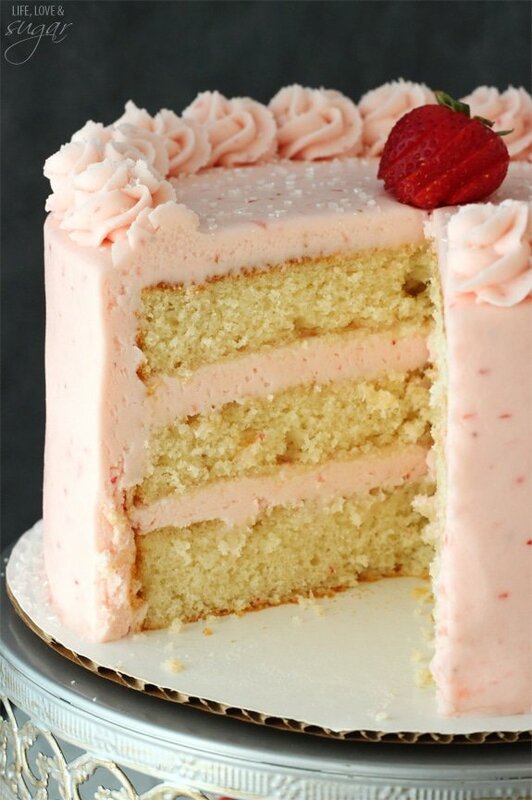 Next time I’m going to make this with raspberries. 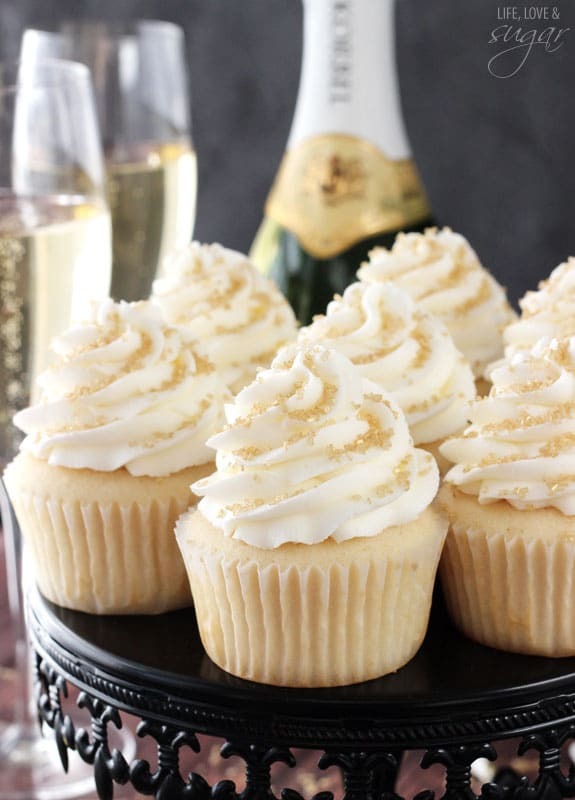 What could you add to go without the champagne? I’d probably just replace it with water, then add about 1/2-1 tsp vanilla extract to the filling. I served this for New Year’s Eve dinner. It was easy to prepare and made a beautiful presentation. Though I could have prepared this in my round tart pan, I bought a rectangular tart pan because I love the shape for this dessert. Guests thought it was delicious and appreciated how light it was. 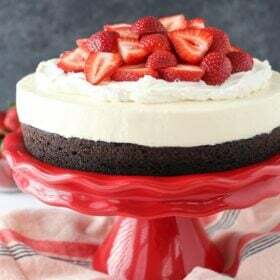 It’s a great alternative to a heavy cheesecake. Thanks for the excellent recipe!